When I look back and reflect on a year, my first instinct is to be negative. “I never did build those cold frames.” “I didn’t have a fall garden at all.” “I still didn’t learn how to drive!” However, while scrolling through my blog, I found an old post titled “16 Skills I Learned in 2016.” It was fun to read what I had learned that year, and thinking about 2018, I realized that I learned an incredible amount this past year. Sometimes I have to remind myself of how far I’ve come, even if I didn’t do everything that I hoped I would. 1. Identify dozens of plants. Point out a bird and I can tell you whether it’s a warbler or a wren, but until this year I could only identify a handful of plants. Zach and I worked together to start learning more plants— beginning with the ones we could eat— and although I still have a long way to go, I’m able to spot patterns now, and at least make educated guesses about whether I’m observing a leguminous vine or some species of dock. 2. Raise chickens. This has been one of my favorite things I’ve learned! 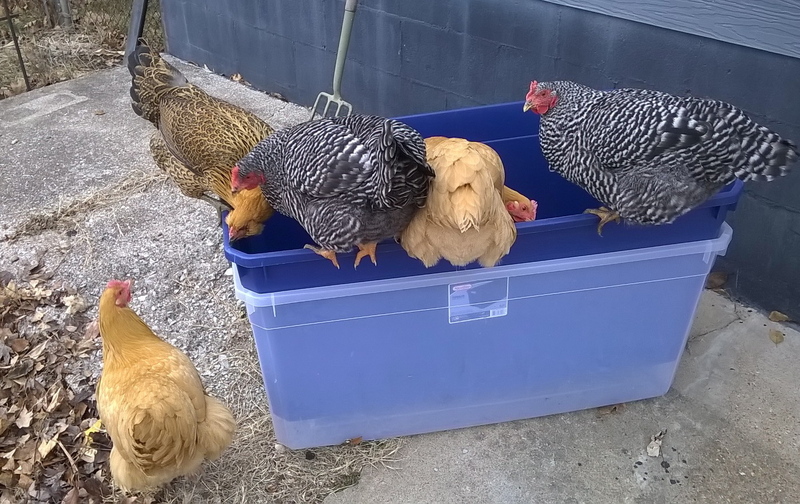 Reading about keeping chickens was incredibly daunting, but once we actually started raising them, I realized that, like many things, it’s easier in practice than it is in theory. 3. Be happy with a simple peanut butter sandwich. 4. Cook and eat weeds. I’ve always been able to identify dandelions, violets, field garlic (“onion grass”), stinging nettle, and mulberries, and even snacked on them upon occasion, but this was the year that I sat down and actually learned how to make them taste good. There is so much free food growing around! 5. Make sourdough bread. I have my favorite whole-wheat sandwich loaf recipe memorized, and incorporate it into my weekly routine. 6. Make flatbread through feel, rather than a recipe. After making bread so many times, I’ve started to get a feel for the proportions of flour, water, salt, and starter— and so I can make pizza crust or flatbread without measuring anything. It’s a fun way to use up the extra starter! 7. Notice when my brain is being hacked by advertisers. I wrote a blog miniseries about this, here, here, and here. 8. Cut hair. Well... this one is debatable. But I did give myself and Zach haircuts, and nobody reacted in shocked horror (or noticed at all). So I’m calling that a win! 9. Balance salt, fat, acid, and heat in my cooking. Samin Nosrat’s Salt Fat Acid Heat is a must-read! 10. Grow sweet potatoes, butternut squash, watermelon, and cucumbers. I had never grown (or successfully grown) any of these crops before, but this year they all grew like weeds. 12. Allow my mind to be changed. I’ve tried to embrace more fully the idea that I can be wrong, and focus on reading perspectives and opinions that stretch me out of my comfort zone. It’s not fun, but the paradigm shifts are well worth the effort. 13. Preserve produce. I learned how to cure squash and sweet potatoes, cook down fresh tomatoes into paste, and preserve basil by mixing it with olive oil and salt. I also hung bundles of basil, thyme, oregano, and peppermint to dry in the dining room, and now I’m enjoying the benefits. 14. Appreciate the true cost of food. I read several thought-provoking books about the impact that our eating choices have on the environment, the culture, and our spiritual lives. I highly recommend The Third Plate by Dan Barber, Kiss the Ground by Josh Tickell, and Food and Faith by Norman Wirzba. 15. Scale back our everyday spending. I came into this year hoping to cut back on our spending more than ever before, and I think we’ve been successful. It doesn’t feel like deprivation— we have plenty of walks and hiking, foraging and gardening, reading, potlucks, board games, and library DVDs. 16. Handle big expenses. Between a lot of doctor’s visits and having to replace our air conditioner and furnace, it’s been a year of cringe-worthy expenses. However, living below our means and having a cash cushion has helped us weather these expenses fairly gracefully, a trait I hope I’ll keep in the future. 17. Reframe questions. In permaculture design, knowing how to ask a question is an extremely important part of the process. For instance, instead of asking, “How do I grow all my own food?” you can ask, “How do I meet my food needs sustainably?” This kind of reframing has been key in our decision-making and dreaming this past year. 18. Make pumpkin pie from scratch. I grew pumpkins, harvested and cured them, baked them, scraped out and pureed the flesh, and used that to make pie for Thanksgiving. It was pretty simple, but for some reason, this was one of my proudest skill-building moments of the year. What did you learn this last year? What do you hope to learn this year?